Adopted: I think this time I got it right!!! My new mommy said she did not want a boy that she liked girl dogs then she met me!!! Ya know they say the way to a man's heart is through his stomach well the way to a woman's heart is through her heart!! Ya show her that you are an honest and loving young man and she will fall in love!!! My sister Sally was adopted from Harlequin Haven too!!! My beautiful mommy and sister!! When my owners no longer wanted me I was taken to the Warren County Animal Shelter I was not doing well at the shelter so they called Harlequin Haven Great Dane Rescue to come for me!! I am doing great here, I have lots of Danes my age to play with and tons of toys!! 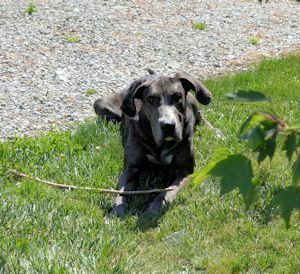 Update 6/19: Just thought you might like to see the stick I found when I was playing in the yard!! Update April 9, 2017: Well so much for forever!!! I am back at the rescue again looking for my forever home!! I am beginning to agree with Grandma the only forever home is the rescue cause they love us no matter what and are always here for us!!!!!!!!! !